I’ve just returned from a few days away staying in Anglesey in North Wales. I was staying in a holiday cottage in a village with an unpronounceable name with my friend, photographer and fellow blogger Poppy and her BB, not to mention Lottie, a beautiful white German Shepherd. I’d never visited this part of Wales before and it was a real pleasure. 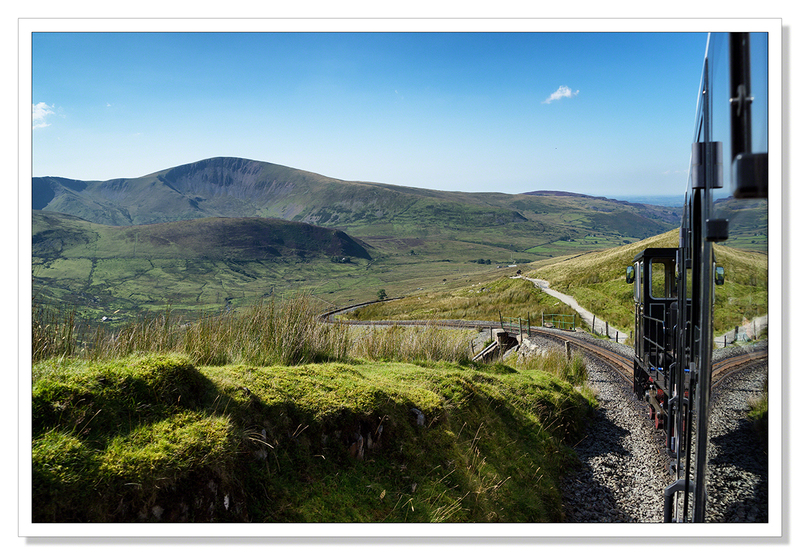 We were very lucky with the weather and given the forecast was looking so good, we booked a trip to the top of Snowdon on the little train that runs from the station at Llanberis to the very top of the mountain. Poppy stayed with Lottie while her BB and myself set off for the top. 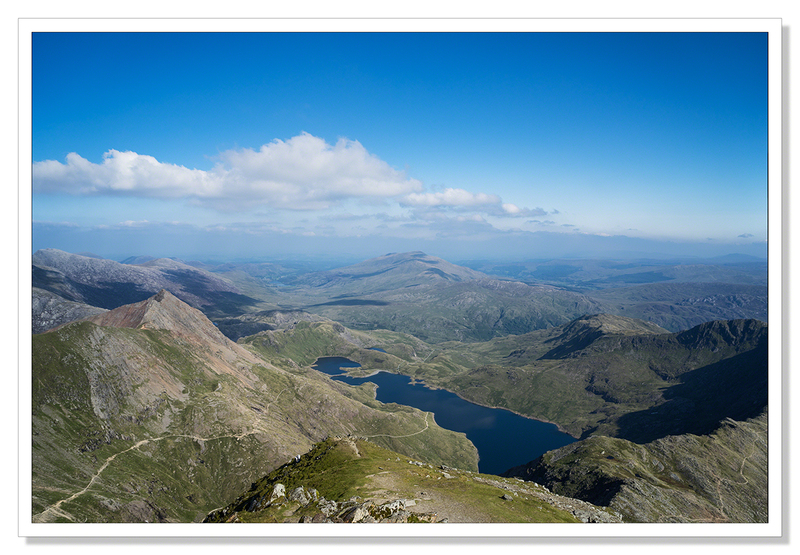 Snowdon is the UK’s third highest peak at 1085m or 3560ft above sea level. The mountain is quite unique of course in that the other two peaks that beat Snowdon in terms of height above sea level, Ben Nevis and Càrn Eige, require a great deal more effort to reach their respective summits. These two peaks I should mention are in the Scottish Highlands of course. As my hiking days are over sadly, being able to catch a train to the top is a very real bonus. 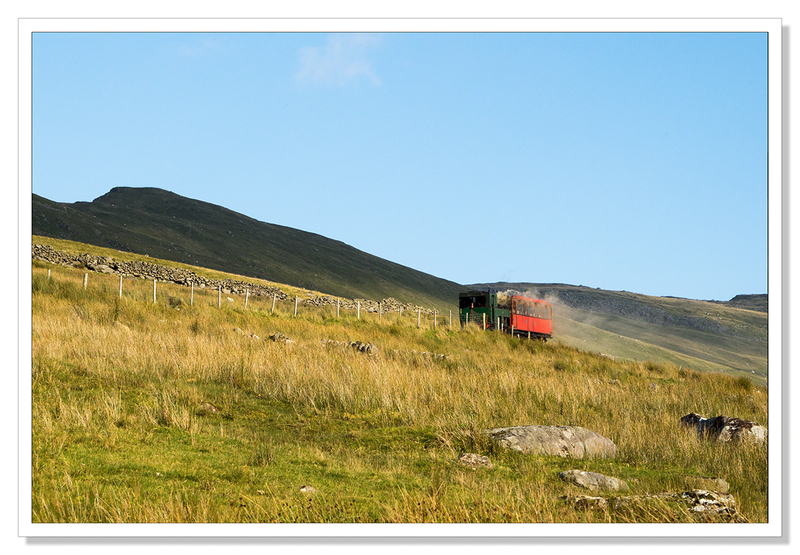 There are two services that run from Llanberis. There’s the diesel service, the only one that had any tickets left, and the more romantic perhaps, steam service. As the picture of the steam service below illustrates however, romanticism comes at a price and I was quite glad I was only able to get the diesel ticket. In my experience, smoke aside, there’s an awful lot of soot in coal smoke. Diesel although not great, is definitely the cleaner fuel. Given the weather, I knew I wasn’t going to be taking fine art, moody, mountain landscape photographs on my way to the top. I certainly wasn’t complaining however. As the conductor pointed out, there have been very few clear days at the summit of Snowdon this year. 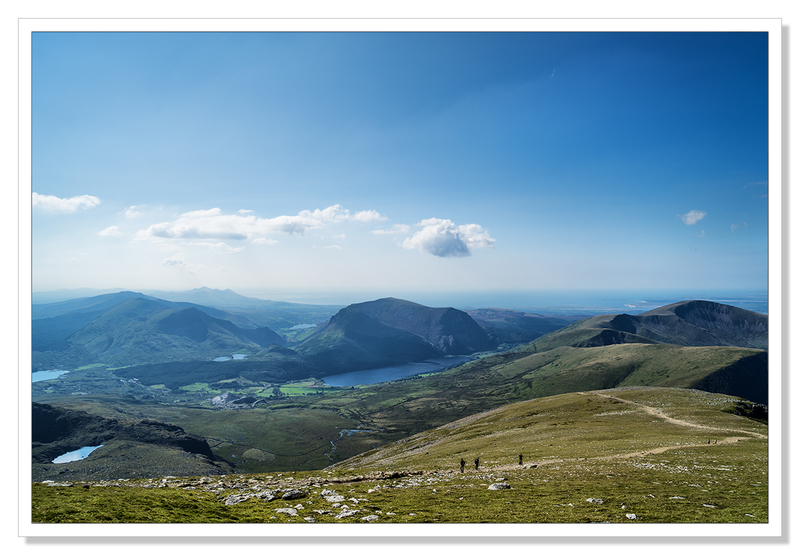 We were very lucky to be treated to the spectacular views in the photographs below..
All pictures were taken with a Sony A7R and a Carl Zeiss 24-70mm lens. 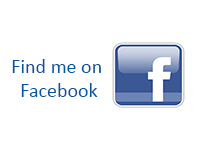 Click on the images for a clearer, sharper view! This entry was posted on September 12, 2015 by Chillbrook. It was filed under Photography, Photography and Travel and was tagged with Adrian Theze, Cornwall Photographic, Countryside, Landscape Photography, Llanberis, North Wales, Photography, Snowdon, Snowdonia, Sony A7R, Steam Train, Wales. Very nice; some of the photos remind me of the vistas from atop Pikes Peak. Thank you Emilio! The views were fantastic. I can feel that sweet sense of being above it all from these photos – such a breadth of view, the distant trails and cloud shadows. It was wonderful to be up there above it all Lynn. The only drawback with taking the train is you have a very limited time before the train departs again. I could have spent the entire afternoon up there. Sadly that’s a pleasure only afforded to those that can walk down..
Toot Toot ChillB ! A jolly few days in an unpronouncable village in Angelsey how fortunate you both were that day with the weather conditions . I guess it’s about time I put together a few of my Summer clicks too …. You are one very lucky bloke! What fantastic weather to go up Snowdon. I have never done it so I thank you for those delicious views and the feeling of peace. Awe inspiring photos. Makes me want to go there now. I have been around there but it was winter and the train wasn’t running otherwise we would have gone up. Needs a good weather day though to appreciate those views. A thought though for the next nice day. Thank you very much! It certainly is a very beautiful area! You’re very lucky to be studying at Bangor! I love it up there. It has been a long time for me. I must rectify that soon…. It is very beautiful. I hope you do manage to make the trip soon..
Beautiful photographs, I have have spent some time in this area as my Dad used to live in Anglesey. Thank you Debz, it’s a lovely place! I laughed at your comment about the unpronounceable name. I have a friend in Twywn, and every year when I send her birthday and Christmas gifts, I get very strange looks at the post office. The landscape is marvelous, and what a train ride that would be. Beautiful scenery. Incidentally, I watched a video on youtube where the weather man pronounced “Llanfairpwllgwyngyllgogerychwyrndrobwllllantysiliogogogoch” without hesitation. How very cool to get all the way up there by train! Beautiful photos, Adrian! Absolutely stunning views. 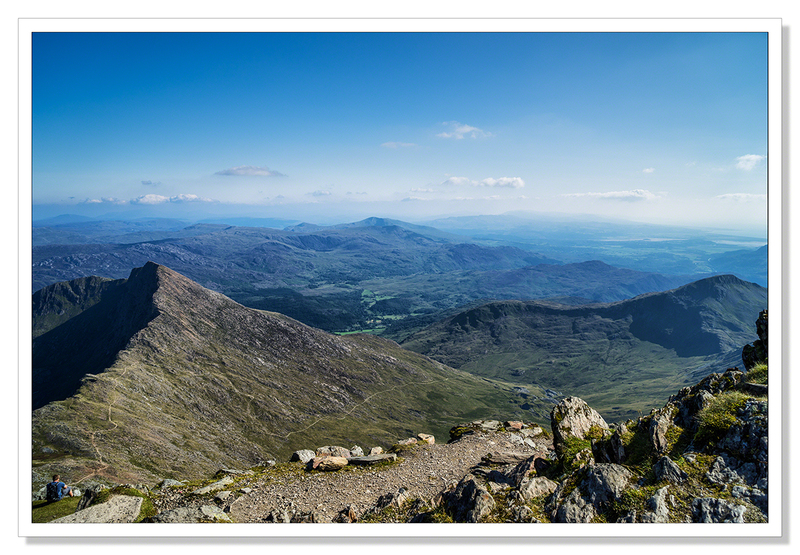 Great shots Adrian…..Snowdon isn’t that far from us, but I’ve never been to the top myself. Thank you for this. Went 1/2 way up Snowdon with my Grandmother years ago. We were walking! I remember it like it was yesterday – but it was 28 years ago – gosh! Lovely scenery. Wales is truly beautiful. What a lovely spot with some glorious views! Great series of photos, makes me feel the scent of autumn in the air. Thank you Randall. Autumn is definitely on its way..
I’ve actually lived on the North Wales coast for thirty years but still haven’t been to the top of Snowdon! Probably have visited west Cornwall more often! Lucky you with the weather, and lovely photos! 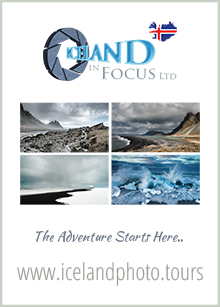 What amazing views from the summit and revelled in the detail in your photos! I was in Wales this past summer and for such a small country it has stunning countryside. Thanks. Wonderful views Chillbrook, you can feel the clarity of that cool crisp air! Astonishingly beautiful.I think this place was made for photographing. Thanks! It certainly is Isabel, thank you! 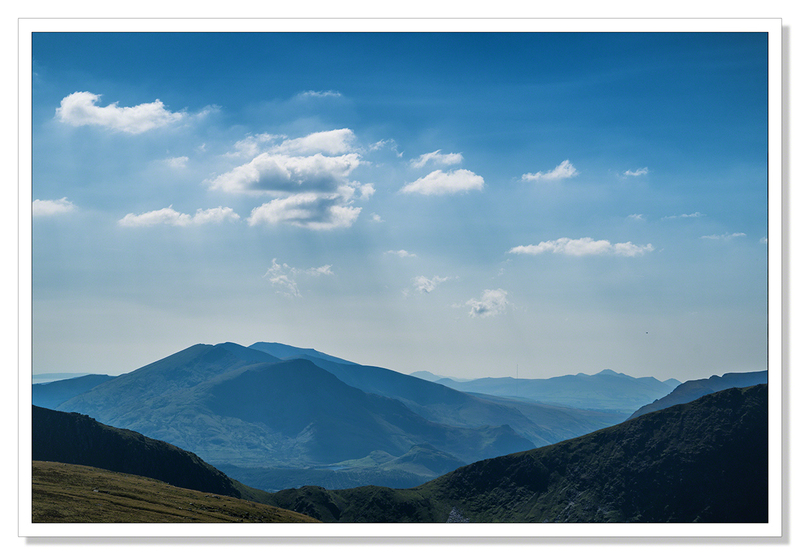 Snowdonia is my favourite mountain area in the UK and I feel homesick seeing these images. What a beautiful day you had. 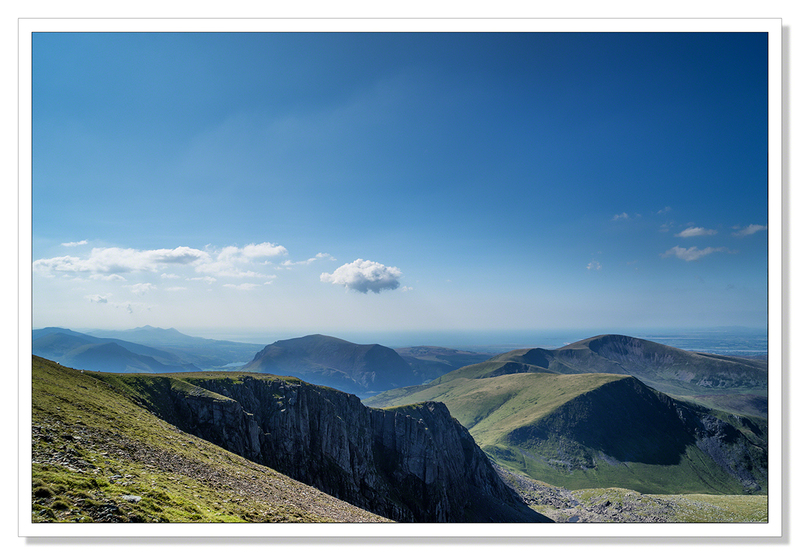 There is something very special about standing on Snowdon in good weather and seeing the sea in the distance – and in more than one direction if you are lucky. I’ve never been on the train but I’ve stood on the summit more times than I can remember including under a dusting of snow having delicately completed the crossing from Crib Goch. Thank you Andy. I can understand why you love Snowdonia so much. What I wouldn’t have given to be able to walk up that day! What a spectacular landscape – and it must have been an amazing train ride. As always your photos are outstanding, Adrian. Thank you so much Otto. It really was an amazing trip and the views from the top quite spectacular! 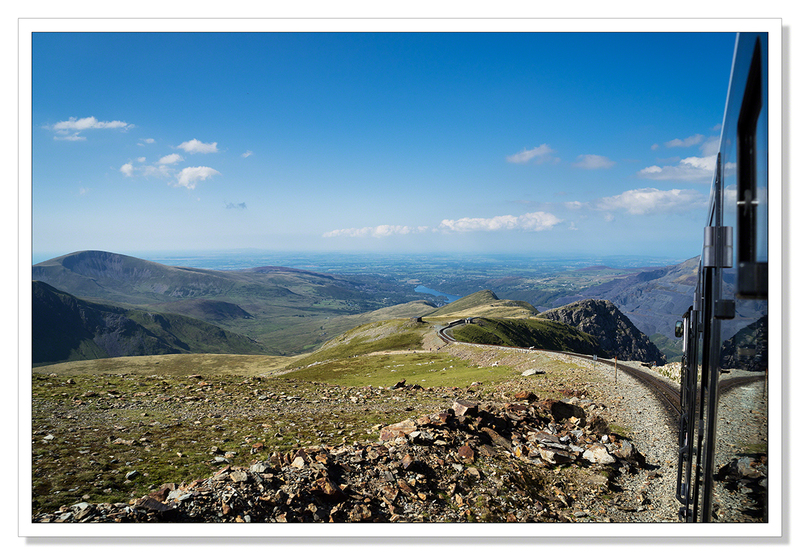 Love your captures of the beautiful scenery going up to the top of Snowdon, Adrian. I’m so glad you had the weather on your side on this day, it makes all the difference. Were you a keen hiker before? Great photo essay Adrian. It brought a longing to see the view in person.